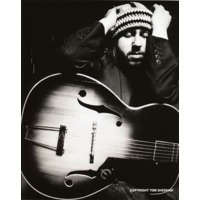 Damon Gough (stage name Badly Drawn Boy) is an Englishalternative music singer/songwriter. He was born on 2 October 1969, in Dunstable, Bedfordshire. He grew up in the Breightmet area of Bolton, Lancashire, England. Damon Gough chose his stage name from the title character in the show Sam and his Magic Ball, which he saw on TV at a party in Trafford, Manchester in 1995. Before he thought of using this name he made some business cards, each one unique, with a printed picture of a drawing by his nephew and a small collage by Gough. This was then laminated and given out to friends and people at clubs in Blackburn and Manchester. A chance meeting with Andy Votel at the Generation X bar in Manchester, where Gough's friends Scott Abraham and Damon Hayhurst were contributing to an exhibition by the Space Monkey Clothing Company and Votel was DJing, led to the foundation of Twisted Nerve Records. Badly Drawn Boy's first 7-inch single, EP1, was pressed the following year to critical acclaim, although only 500 copies were made. In 2002, Q magazine named Badly Drawn Boy in their list of the "50 Bands to See Before You Die", although this was as part of a sub-list of "5 Bands That Could Go Either Way" on account of Gough's tendency to talk and tell stories for extended periods in concert rather than play songs.